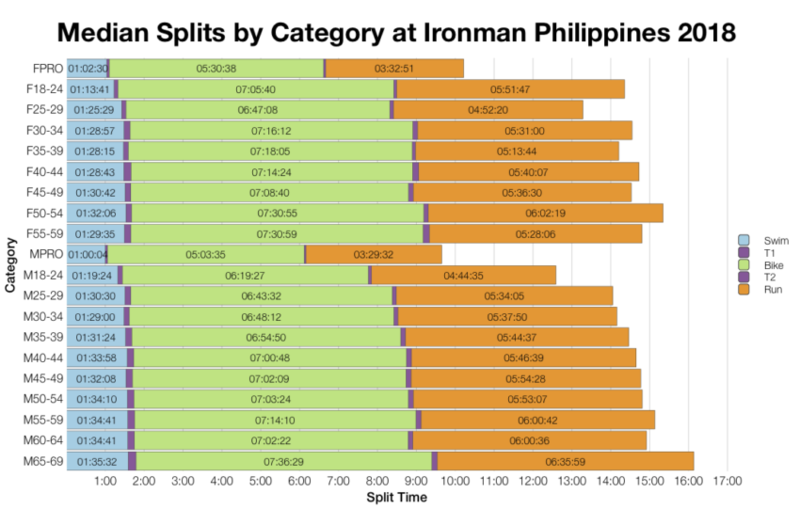 This week’s race analysis is for a new addition to the Ironman series – Ironman Philippines. The race drew over 1,000 athletes with 30 age group slots on offer. 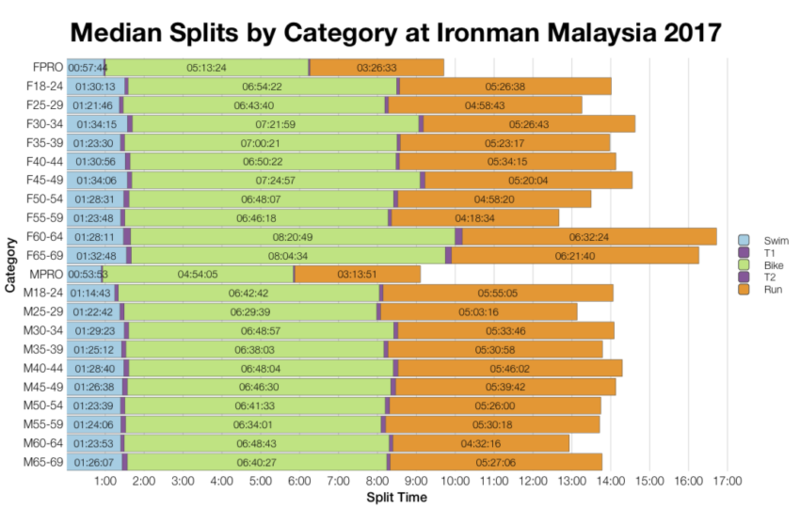 As with any new race I don’t have historical times for comparison, but I’ve included some data form Ironman Malaysia for a comparison. Like Malaysia this proved to be a slow Ironman course, with a small group of competitive age groupers. Malaysia 2017 is actually a good comparison – both races have similar median times for each split. They differ at the front of the curve though where there are far fewer fast age groupers at the Philippines. There could be elements of course and conditions involved, but when the median splits seem unaffected, the bigger difference at the fifth percentile suggests lower numbers at the front. 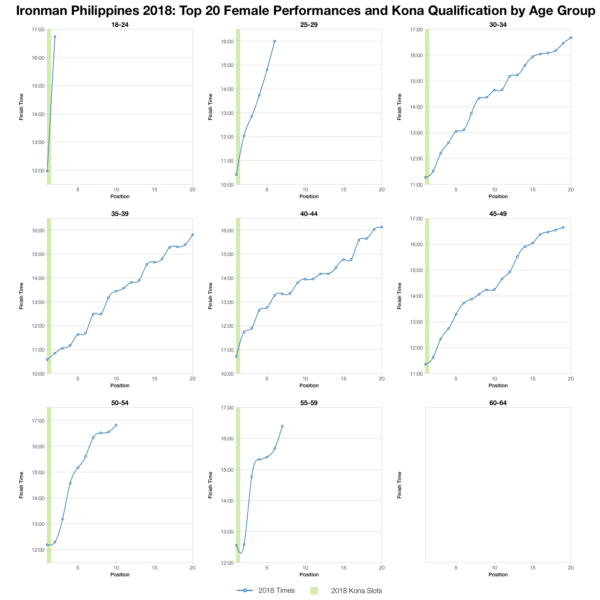 DNF rates at the two races differ on bike and run with the Philippines having much lower percentages pull out. As observed with the distributions the age group median splits follow a similar pattern with varied, but similar times between the two races. The majority of athletes were local, but a good pool was drawn from further afield. 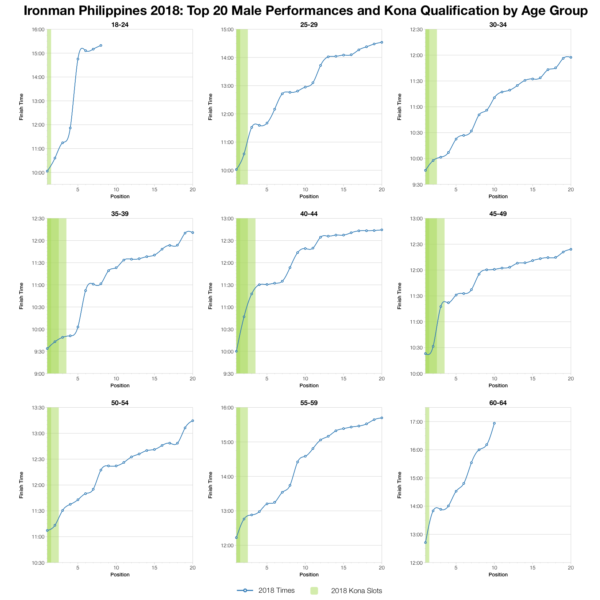 Japanese athletes look to have taken the biggest share of the Kona slots awarded. Without historical context the only thing we can really discern from the top twenty of each age group is how steep the slope is. There’s a large gap between first place and tenth or twentieth place within an age group. A much larger shift in times than we’d typically see for an Ironman of this size. Again, this points to fewer Kona competitive athletes being present. Equally, few slots were on offer so top performances were need for a chance of a slot. I’ve calculated the likely slot allocation at Ironman Philippines based on the start list. From that I’ve determined automatic qualification times before roll down – actually numbers may have varied slightly. You can compare this to other Ironman races on my Kona qualification page. 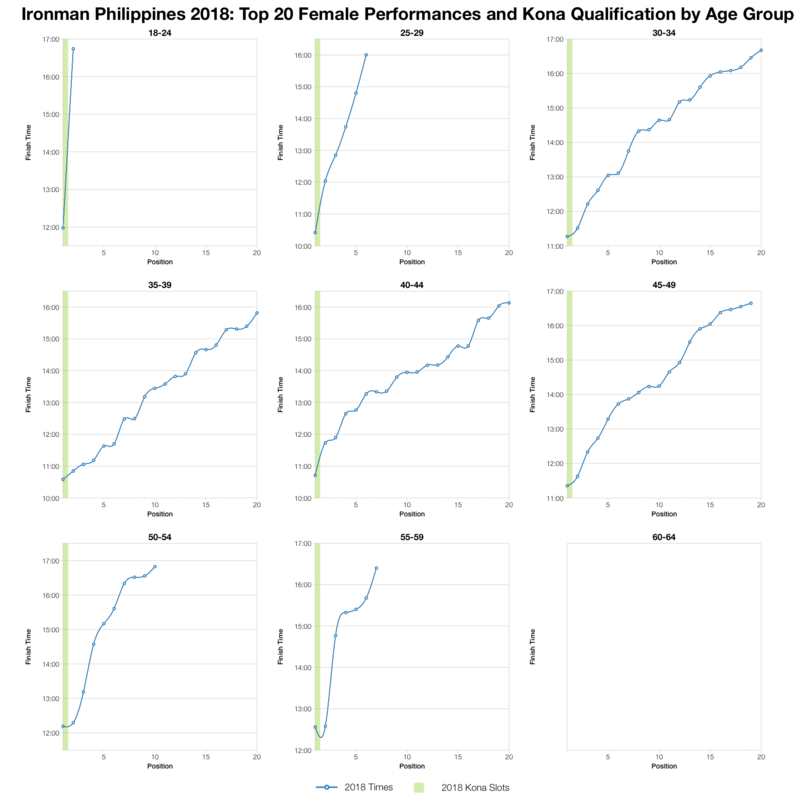 You can access a spreadsheet of the full results from Ironman Phillipines 2018 on my Google Drive.